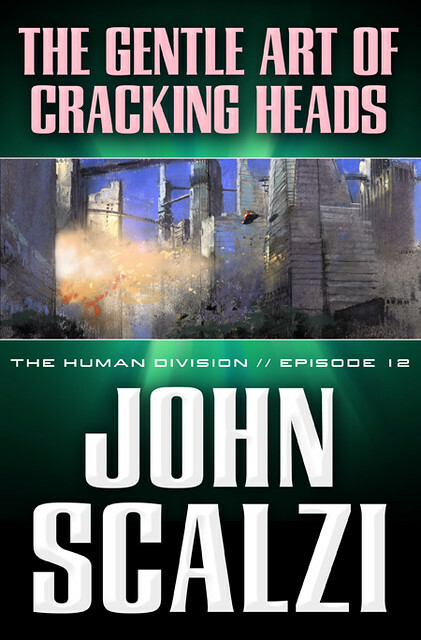 Welcome to the latest, greatest and, sadly, final installment of my serialized review of John Scalzi's serialized novel The Human Division. In case you are just getting on board, here are my reviews for Episode 1, Episode 2, Episode 3, Episode 4, Episodes 5-7 and Episodes 8-10. So far the book is smart, fun and at times very funny, but I've worried about the pace of storytelling and, at times, overdosed on the witty repartee. Through 10 chapters, the book has a cumulative score of 7.40/10. Since this is the last installment in this review series, I'll cover the chapters at hand and then give some final thoughts and issue final bonuses/penalties before giving you that all-encompassing score of scores. A lot of stuff happens in this episode, or more accurately, a lot of stuff gets discussed in this episode. Perhaps the heavy emphasis on dialogue is unsurprising in a novel about diplomats, but your enjoyment of this one will depend entirely on your tolerance for story exposition achieved almost exclusively through conversation. As I've said before, I tend to like Scalzi's dialogue until it passes my tolerance threshold for winks and nudges. And in this case, unfortunately, Scalzi does pass that threshold, most egregiously when Harry Wilson goes on an away mission with some aliens who, despite being from presumably vastly different worlds and cultures, waste no time in yukking it up with Wilson in the exact same manner one of Scalzi's quick-witted humans would. Generally speaking, and occasional overload on wit aside, this is a pretty good episode, and does more to move the plot forward than the last 3 or 4 combined. So big kudos for that. At the same time, it also made me realize what's been bothering me about The Human Division this whole time--it's not just that everyone is so damned witty, but that everyone is just too damned nice as well. Even the characters who come off as gruff and tough early on, like Abumwe and Coloma, have by now reveled themselves as serious softies. Sure the villains are still lurking in the shadows, but even the torturer we met in Episode 8 was polite. This book is in dire need of some assholes. Another excessively talky episode, but like A Problem of Proportion, that's mitigated by the fact that it helps move the plot along in meaningful ways. We're back on Earth with potential Wilson love interest Danielle Lowen as she investigates the murder of diplomat Liu Cong. Unfortunately, I can't reveal more without ruining the episode for you, so consider my lips sealed on that front. I will, however, say that the way it ends is pretty compelling. Still, I can't really figure why this kind of episode--slow, talky and centering on someone who has been a bit character up to now (and who doesn't figure to level up to "secondary protag" status until Season 2)--hits us just before the grand finale. It's more appropriate as Act One material, and in that sense underscores the degree to which we've meandered to our current position in Act Three. I mean, was there even an Act Two? Action begins with the Clarke en route to a peace conference of sorts, where the Colonial Union hopes to mend fences with Earth and get that pipeline of soldiers and colonists going again. Abumwe, Wilson and the gang have point, given that they are now officially specialists in pulling off the near impossible. The problem is, there are plenty of folks in the galaxy who might not want this to work out. Unbeknownst to her fellows, Captain Coloma has been tasked with making sure that doesn't happen. But in the absence of any real military deterrent, what could she and her ancient ship actually do in the event of an attack? The thing that makes Earth Below, Sky Above work so well is the pacing. The episode starts slow but then picks up bit by bit until it's raging forward at warp speed. And it doesn't sacrifice the wit and snappy dialogue Scalzi is renowned for either. In short, it's a microcosm of what made the original Old Man's War trilogy so good. On the other hand, it's also a microcosm of what The Human Division as a whole could have been, but isn't quite. Earth Below, Sky Above, you are so rich and tantalizing--why did you have to remind me of the fact that I don't have as much of you as I wish I did? This sets up an ultimate choice for the reader: do you walk away or come back for more? And the bottom line is that I'll be back for more. See, that 4oz/125 filet of space operatic whodunit did whet my appetite, just like a season-ending cliffhanger does on a TV show. And as much as I've complained about the proverbial side dishes of tangents and filler material taking the place of main dish type stuff, I'll be damned if they weren't just charming enough to defuse any righteous NERD RAGE anger I might have pointed in the direction of another author. So yes, The Human Division is fun, funny and smart, and it's worth reading for all the other reasons I've mentioned in the course of this epic review as well. Final Bonuses: +1 for leaving me hungry for more. Final Penalties: -1 for leaving me hungry. Final Nerd Coefficient: 7.62/10. Somewhere between "a mostly enjoyable experience" and "well worth your time and attention."